The Ultimate Fishing Show—Detroit is the one to catch! 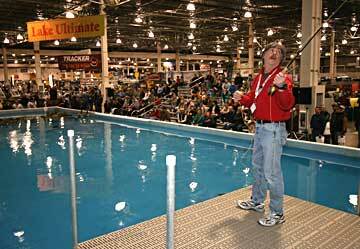 NOVI– The Ultimate Fishing Show—Detroit returns Thursday, January 13 to Rock Financial Showplace, 46100 Grand River Ave. in Novi, for its annual four-day run through Sunday, January 16. Billed as Michigan’s largest pure-fishing show, the huge event, at the center of the nation’s largest freshwater fishing market, is also among the biggest angling shows in the nation. More than 4 acres big. 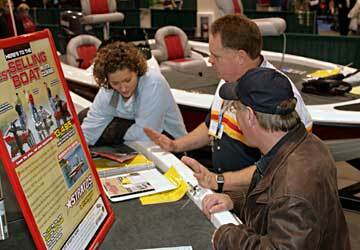 The show brings the best of everything angling to 400,000 licensed anglers within an hour’s drive of the venue. Eight downstate boat dealers offer tremendous selection and value with 200 new fishing boats—everything from 8-foot kayaks to 26-foot offshore trolling craft. Deals abound with buying incentives that include easy financing, extended warranties, cash rebates, factory buybacks, excellent trade-in programs, and special discounts. Scores of fishing tackle displays. New rods, reels, electronics and fishing accessories from southeast Michigan retailers, plus one-of-a-kind lure makers and direct-factory displays from major manufacturers. New vendors include Leverage Landing Net from Oxford, Gale Force Tackle in Northville, and Red Dirt Bait Co. in Indianapolis. Outfitters Expo with charter boat captains, fishing guides, outfitters and lodge owners offering value-packed angling adventures in Michigan, the Great Lakes and Canada and beyond. Lake Ultimate: An enormous indoor lake that holds 110,000 gallons of water, Lake Ultimate is 92 feet long by 40 feet wide by 4 feet deep. Packed with tough-to-catch rainbow trout, it’s the ultimate seminar platform for national experts like Kevin Van Dam, America’s hottest bass fisherman, and many others to offer real-time, fish-catching demonstrations. The Fishing Academy: The country’s biggest and best all-star lineup of fishing experts--30 speakers offering more than 120 seminars, clinics and demonstrations on four stages. New speaker Marianne Huskey, aka “Walleye Woman,” is the only female to compete at the professional level of the AIM Pro Tournament Walleye Series. She also directs the National Professional Anglers Assn.